Citizen Way is a band of brothers - in the literal sense. This infectious rock four-piece is comprised of two sets of siblings with strong ministry backgrounds and a mutual passion for music that began long before the band officially formed in 2004. Band members Josh and Ben Calhoun and David and Ben Blascoe share a camaraderie that is undeniable and results in a unique, unparalleled connection for a band that has plenty to say. These songs have been my anthems this year. They are the perfect driving in the car tunes that you can tap the steering wheel and  sing out loud to. Driving to work they always uplift me and empower me to go about my day knowing 'My God is on my side' and God is 'Bigger than anything I face'. Give it a listen, you'll be singing along too in no time! Albums like Citizen Way's 2.0 need to come with warning signs. The tunes on this record are so catchy that over repeated listening, this album could be highly addictive. Unless you are prepared to allow these songs to linger in your long term memory and incite you to hum along with them when you are in the shower, then give this album a spin. 2.0, in short, is an album that is made to defy the test of time. It is tunes like these that will give Citizen Way longevity and credibility in the contemporary Christian music industry over the long haul. 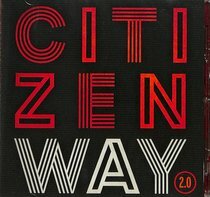 Yet, 2.0 as indicative by its titular, is just the sophomore record of Citizen Way. Formerly known as The Least of These, Citizen Way comprises of Ben Blascoe, David Blascoe, Ben Calhoun and Josh Calhoun. Their 2013 debut album Love is the Evidence gave the team 3 Top 20 Christian singles. Almost 3 years later, Citizen Way looks like they are bound to repeat the same successful fleat. If you ever feel like contemporary Christian music is relatively dull and clich relative to its secular pop counterpart, 2.0 will prove you wrong.